This article is about the town. For the university, see Stellenbosch University. For the municipality, see Stellenbosch Local Municipality. Stellenbosch (/ˈstɛlənbɒʃ/; Afrikaans: [ˈstɛlənbɔs]) is a town in the Western Cape province of South Africa, situated about 50 kilometres (31 miles) east of Cape Town, along the banks of the Eerste River at the foot of the Stellenbosch Mountain. It is the second oldest European settlement in the province, after Cape Town. The town became known as the City of Oaks or Eikestad in Afrikaans and Dutch due to the large number of oak trees that were planted by its founder, Simon van der Stel, to grace the streets and homesteads. A panorama of Stellenbosch, as seen from Papegaaiberg. In 1899 Louis Péringuey discovered Paleolithic stone tools of the Acheulean type at a site named Bosman's Crossing near the Adam Tas Bridge at the western entrance to Stellenbosch. The town was founded in 1679 by the Governor of the Cape Colony, Simon van der Stel, who named it after himself – Stellenbosch means "(van der) Stel's Bush". It is situated on the banks of the Eerste River ("First River"), so named as it was the first new river he reached and followed when he went on an expedition over the Cape Flats to explore the territory towards what is now known as Stellenbosch. The town grew so quickly that it became an independent local authority in 1682 and the seat of a magistrate with jurisdiction over 25,000 square kilometers (9,700 sq mi) in 1685. The Dutch were skilled in hydraulic engineering and they devised a system of furrows to direct water from the Eerste River in the vicinity of Thibault Street through the town along van Riebeeck Street to Mill Street where a mill was erected. Early visitors commented on the oak trees and gardens. During 1690 some Huguenot refugees settled in Stellenbosch, grapes were planted in the fertile valleys around Stellenbosch and soon it became the centre of the South African wine industry. In 1710 a fire destroyed most of the town, including the first church, all the Company property and twelve houses. Only two or three houses were left standing. When the church was rebuilt in 1723 it was located on what was then the outskirts of the town, to prevent any similar incident from destroying it again. This church was enlarged a number of times since 1723 and is currently known as the "Moederkerk" (Mother Church). The first school had been opened in 1683, but education in the town began in earnest in 1859 with the opening of a seminary for the Dutch Reformed Church. Rhenish Girls' High School, established in 1860, is the oldest school for girls in South Africa. A gymnasium, known as het Stellenbossche Gymnasium, was established in 1866. In 1874 some higher classes became Victoria College and then in 1918 University of Stellenbosch. The first men's hostel to be established in Stellenbosch was Wilgenhof, in 1903. In 1905 the first women's hostel to be established in Stellenbosch was Harmonie . Harmonie and Wilgenhof were part of the Victoria College. In 1909 an old boy of the school, Paul Roos, captain of the first national rugby team to be called the Springboks, was invited to become the sixth rector of the school. He remained rector until 1940. On his retirement the school's name was changed to Paul Roos Gymnasium. In the early days of the Second Boer War (1899–1902) Stellenbosch was one of the British military bases, and was used as a "remount" camp; and in consequence of officers who had not distinguished themselves at the front being sent back to it, the expression "to be Stellenbosched" came into use; so much so, that in similar cases officers were spoken of as "Stellenbosched" even if they were sent to some other place. At the time of the 2011 census, the population of the urban area of Stellenbosch was 77,476 people in 23,730 households. 50% of the residents spoke Afrikaans as their home language, 28% spoke isiXhosa, and 8% spoke English. (10% of the residents, principally those in student residences, were not asked their language.) 37% of the population identified themselves as "Black African", 35% as "Coloured", and 26% as "White". The Stellenbosch Municipality extends beyond the town of Stellenbosch itself to include rural areas, villages, and the town of Franschhoek. At the time of 2011 census the municipal population was 155,728, while by 2016 it was estimated to be 173,197. Stellenbosch's eastern suburbs in the winter months. In the background are the snowcapped Jonkershoek Mountains, with the prominent peak "The Twins" (elev. 1,494 m) visible. Stellenbosch is 53 km (33 mi) east of Cape Town via National Route N1. 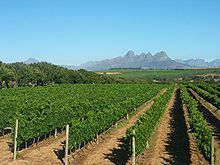 Stellenbosch is in a hilly region of the Cape Winelands, and is sheltered in a valley at an average elevation of 136 m (446 ft), flanked on the west by Papegaaiberg (Afrikaans: Parrot Mountain), which is actually a hill. To the south is Stellenbosch Mountain; to the east and southeast are the Jonkershoek, Drakenstein, and Simonsberg mountains. Die Tweeling Pieke (Afrikaans: The Twin Peaks) has an elevation of 1,494 m (4,902 ft); the highest point is Victoria Peak 1,590 m (5,220 ft). Jonkershoek Nature Reserve lies about 9 km (5.6 mi) east of Stellenbosch, and the Helderberg Nature Reserve is about 23 km (14 mi) south via provincial route R44. Just south of the Helderberg Nature Reserve is Strand, a seaside resort town. The soils of Stellenbosch range from dark alluvium to clay. This, combined with the well-drained, hilly terrain and Mediterranean climate, prove excellent for viticulture. Summers are dry and warm to hot, with some February and March days rising to over 40 °C (104 °F). Winters are cool, rainy and sometimes quite windy, with daytime temperatures averaging 16 °C (61 °F). Snow is usually seen a couple of times in winter on the surrounding mountains. Spring and autumn are colder seasons, when daytime temperatures hover in the twenties. Stellenbosch is a warm weather training venue for cyclists, track and field squads, and triathletes. The Stellenbsoch Sports Academy opened its doors in 2012 and hosts several rugby teams on a permanent basis, such as the Springbok Sevens and Western Province. The Stellenbosch, Paarl and Franschhoek valleys form the Cape Winelands, the larger of the two main wine growing regions in South Africa. The South African wine industry produces about 1,000,000,000 litres of wine annually. Stellenbosch is the primary location for viticulture and viticulture research. Professor Perold was the first Professor of Viticulture at Stellenbosch University. The Stellenbosch Wine Route established in 1971 by Frans Malan from Simonsig, Spatz Sperling from Delheim and Neil Joubert from Spier, known as Stellenbosch American Express® Wine Routes since 2002, is a world-renowned and popular tourist destination. This route provides visitors the opportunity to experience a wide range of cultivars and includes farms such as Warwick and JC Le Roux. The region has a mediterranean climate with hot dry summers and cool wet winters. Stellenbosch lies at the foot of the Cape Fold mountain range, which provides soil favourable to viticulture. Grapes grown in this area are mainly used for wine production, as opposed to table grapes. The region possesses a wide range of soils in the area, from light, sandy soils to decomposed granite. Stellenbosch Cabernet Sauvignon is beginning to get a good reputation as a fine wine. Stellenbosch University is one of South Africa's leading universities. This institution has a rich history dating back to 1863 and has 10 faculties, including Engineering, Commerce, Science and Arts. The Department of Electrical and Electronic Engineering is the only university department in the southern hemisphere which has successfully built a communications satellite Sunsat which was launched in 2000 and orbited the earth for three years. The University currently has about 29,000 students. White students in 2014, namely 18 636, constitute 63.4% of all students enrolled. Although the official language of the university is Afrikaans, most post-graduate courses are presented in English. The university is in the process of introducing more English centered undergraduate courses following mass protest by the student body. The university council with the concurrence of the senate approved a new language policy on 22 June 2016 for implementation from 1 January 2017. Since the campuses are situated in the Western Cape, the university has committed to introducing multilingualism by using the province’s three official languages, namely Afrikaans, English and isiXhosa. The municipality currently uses a badge consisting of a fleur de lis and a cross issuing from a stylised bunch of grapes. In the past the various local authorities used coats of arms. Drostdy — The drostdy (1685-1827) was the local authority for the whole Stellenbosch district, including the town. In 1804, when the Cape Colony was ruled by the Batavian Republic, the government assigned an armorial seal to the drostdy. It depicted the shield of arms of Simon van der Stel superimposed on an anchor representing Hope, on a golden background. In 1814, the British occupation authorities ordered the drostdyen to use the royal coat of arms instead. Van der Stel's arms were quartered : 1 two red towers on a golden background; 2 a peacock on a red background; 3 three silver discs or balls stacked 1 over 2 on a red background; 4 a red tower on a golden background. In the centre was a smaller blue shield displaying six silver crescents (or, possibly, ribs) 2, 2 and 2. Municipality(1) — The Stellenbosch municipality was formed in 1840, to administer the town, but not the rest of the district. Although it was not the legal successor to the drostdy, it adopted the old drostdy seal of arms. A few changes were made to the arms over the years : quarters 2 and 3 were changed from red to blue; the peacock was turned to a profile position; the three silver discs or balls were changed to golden rings; the central shield was changed from blue to black. Whether any of these changes was intentional, or whether they were the result of artistic errors, is unclear. Municipality (2) — The municipal council had a new coat of arms designed by Michael Dawes in 1951. After some improvements, the College of Arms granted them on 26 June 1952. They were registered at the Bureau of Heraldry on 31 August 1979. The new design was a golden shield displaying the three towers from the Van der Stel arms, and a red fess displaying the peacock between golden rings. The crest was an anchor entwined with oak leaves and acorns. The motto Fortis et superbus ("Strong and proud") was chosen. Divisional council (1) — The divisional council, established in 1855, administered the rural areas outside the town. At some point, it adopted the plain Van der Stel arms, i.e. a golden shield displaying three red towers. Divisional council (2) — The divisional council had its arms re-designed by Cornelis Pama in 1970, and registered them at the Bureau of Heraldry on 30 October 1970. The shield was divided down the centre into gold and red, and the three towers were counterchanged. A red tower was added as a crest. Kaya Mandi — The local authority for the Black township of Kaya Mandi registered arms at the Bureau on 27 November 1987. ^ a b c d e f "Main Place Stellenbosch". Census 2011. ^ "Definition of STELLENBOSCH". www.merriam-webster.com. Retrieved 16 June 2018. ^ A Universal Pronouncing Gazetteer. Thomas Baldwin, 1852. Philadelphia: Lippincott, Grambo & Co.
^ Seddon, J. D. (October 1966). "The Early Stone Age at Bosman's Crossing, Stellenbosch". The South African Archaeological Bulletin. South African Archaeological Society. 21 (83): 133–137. JSTOR 3888433. ^ Deacon, H. J. (1975). "Demography, Subsistence, and Culture During the Acheulian in Southern Africa". In Butzer, Karl W.; Isaac, Glynn L. (eds.). After the Australopithecines: Stratigraphy, Ecology, and Culture Change in the Middle Pleistocene. pp. 543–570. ISBN 9783110878837. ^ Fairbridge, Dorothea (1922). "XII – Stellenbosch". Historic houses of South Africa. London: H. Milford, Oxford university press. p. 109. Retrieved 31 January 2011. ^ "History of Stellenbosch". ShowMe™ - Stellenbosch. Retrieved 6 September 2017. ^ State of the Cape of Good Hope, in 1822. William Wilberforce Bird. 1823. London: J. Murray. ^ Botha, Colin Graham (1921). The French refugees at the Cape. Cape Town: Cape Times Limited. p. 155. Retrieved 31 January 2011. ^ Trotter, A.F. (1903). Old Cape Colony a chronicle of her men and houses from 1652-1806. Westminster: A. Constable & co., ltd. pp. 174, 179. Retrieved 31 January 2011. ^ "Rhenish prepare for their 150th birthday". Eikestad News. Eikestadnuus. 17 February 2006. Archived from the original on 20 January 2008. Retrieved 13 November 2007. ^ Huisdinge | Harmonie Dameskoshuis. .sun.ac.za. Retrieved on 2013-07-29. 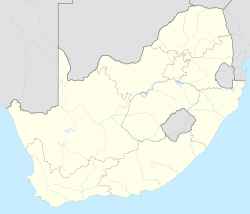 ^ Combined population statistics of the Main Places Welgevonden, Cloetesville, Khayamandi, La Colline, Tennantville, Idasvallei, Stellenbosch, Onder Papegaaiberg, Devon Valley, Dalsig, Kleingeluk, Paradyskloof and Brandwacht, which constitute the continuous urban area. ^ Community Survey 2016: Provincial profile: Western Cape (PDF) (Report). Statistics South Africa. 2018. p. 8. Retrieved 26 July 2018. ^ "Stellenbosch American Express® Wine Routes – Our Story". Archived from the original on 9 February 2014. Retrieved 2 March 2014. ^ Cape Town Gazette No 418 (15 January 1814). 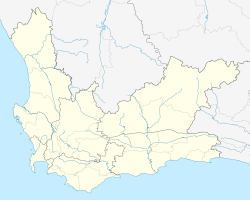 Wikimedia Commons has media related to Stellenbosch. Wikivoyage has a travel guide for Stellenbosch.